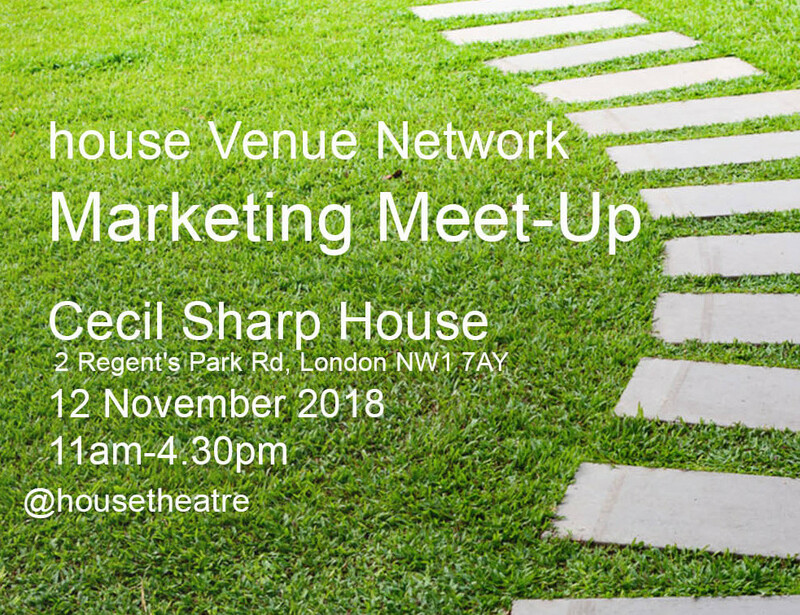 An welcoming professional development event for marketing staff from venues in the house network. There are opportunities throughout the day to meet with colleagues from venues in the south east, to share experiences and cultivate new connections; and to hear more about the house network and your part in it. house is on a mission. We want to support venues in our network to think creatively about audience development. To start plans. To develop existing plans. To deliver on them. Over the next few months, house is planning an action-research project aimed at helping us better understand audiences across the entire region. This session is all about helping you to focus on your audience development goals. Whether you want to reach more people, build relationships with existing audience members, or broaden the range of people engaging with your work, it will share some practical tools and tried and tested techniques to help you start or to continue your journey. Julie will enable you to build empathy and understanding about current and potential audiences and to start to identify what might need to change in order to achieve your audience development goals. Julie Aldridge is a business and marketing consultant working in the arts and cultural sector. She helps leaders and teams to explore future ambition, consider how they might become more relevant and meaningful to people, and devise strategies to build a resilient future. She is co-author of Open Up, a guide to help organisations grow and diversify their range of visitors. Prior to becoming a consultant, Julie was Executive Director of the Arts Marketing Association (AMA) for over a decade. There’s never enough time – and as marketers, we’re being asked to fit more and more into our days. Especially, we’re often tasked with achieving more strategic aims while still focusing on maximising the audience for every event and show through our doors. This short session will give a few tips for working more efficiently – individually, as a team and with your managers – and will work through examples of how to prioritise the everyday and the strategic. Some preparation before the session will be useful. Information will be sent to delegates upon booking. Rachel Escott is an experienced arts marketing consultant, having worked alongside clients for over 15 years to help them become more effective in their marketing and audience development ambitions. Sometimes we feel that our friends in the media have their fingers in their ears when we want them to listen, and are banging down the door when we’d rather they weren’t. A good PR strategy means being able to act decisively when facing down a crisis and spending time and resource effectively when trying to galvanise media interest. In this hour-long session, Andy will deliver a case-study of how Colston Hall in Bristol manages media relationships, and what happened when the media storm hit after the Hall announced its decision to reopen in 2020 with a new name, ending the 150-year association with slave-trader Edward Colston. Through examples and lessons learned from the day-to-day of managing the media, this session aims to provide delegates with some practical tips to consider when developing your own PR strategy. The first half of the session will be a presentation, with a q&a session for the final 30 minutes. Andy Boreham is the Head of Marketing at Bristol Music Trust, which is responsible for running Colston Hall and the city’s music hub Bristol Plays Music. Commencing in 2018, the Trust is embarking on the largest capital redevelopment programme ever to take place in the South West arts sector – a two-year £48.8 million transformation of the Hall’s performance spaces. Over the next two years Andy is responsible for leading on the venue’s highly publicised name change and rebrand, as well as leading the marketing team to develop a new marketing strategy for the Trust, deliver campaigns to promote the venue’s city-wide interim music programme, their award-winning music education programme and lead with the Director of Communications in stakeholder and PR engagement around the transformation and Trust’s work. Andy has 10 years’ experience working in arts marketing and local government communications, beginning as a Marketing Assistant at a regional theatre in Essex before joining Bristol Music Trust in 2013 where he became Head of Marketing in January 2017. Times: Arrivals and refreshments from 10.30am; session 1 starts promptly at 11am. The day will conclude at 4.30pm. Tickets: This is a free event. Up to two places per venue/organisation. Personal assistants/carers free of charge – please select that option when booking. Refreshments and lunch will be provided free of charge. Access: Cecil Sharp House has step-free access to all floors, and a lift from the car park. For venue-related access enquiries, please contact the venue directly on info@efdss.org or call 020 7485 2206, referencing this event. If you have any additional access requirements for the session, including if you require a Personal Assistant or carer ticket, please contact emma@housetheatre.org.uk when booking.